I don't want to mention any names (Glenn) but a friend of mine was very depressed recently. He had taken a big gamble and lost so his family was going to be kicked out of their house and onto the street the following day. He was at a loss as to what to do and thought there was only one way out. He drove to the edge of a cliff and parked there. He rested his head on the steering wheel, tears pouring down his cheeks. 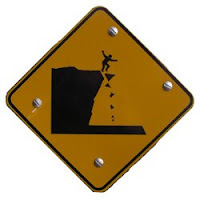 His right foot on the brake was trembling as he inched closer to the edge of the cliff. Anxiously all the nice people there took up a collection and they rounded up enough money for him to pay his debt and keep his home ..... Good thing his bus was full that day! I believe that Michael may have learned his persuasion techniques from my ex-wife. Well, lucky for Glenn he wasn't driving the short bus that day.